First Person: Networking isn’t scary! » Newsroom » Archive » 2012 » First Person: Networking isn’t scary! Chelsea Darlington '14, of Tacoma, Wash., talks with Overseer Chris Kosmos '70, CEO/principal/managing member of Aiolian, LLC. A former Whitman student once told me that she had 90 informational interviews before she landed a job; thus, as a graduating senior, one of the activities in which I have invested the greatest amount of time is networking. I began by emailing and “Linking In” with family friends and other people my parents know professionally. Then, I would ask if I could take those individuals who responded out to coffee or lunch. At the end of the session, I always made it a point to ask whomever I was with for any people in their network that they felt I should contact. 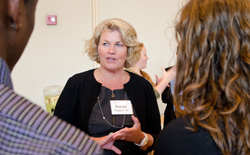 Overseer Sonya Campion ’83 discusses networking in the fundraising and philanthropy arena. 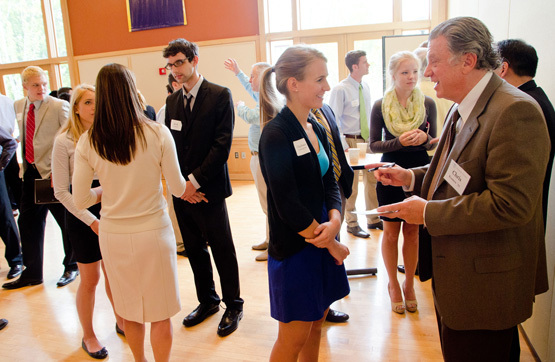 Additionally, I go to as many Whitman alumni networking sessions as are offered. Most recently, I joined dozens of my classmates at a networking session with members of the college’s Board of Overseers (most of whom are alumni), who were on campus for the annual meeting. They all were incredibly personable and eager to meet current students. I particularly enjoyed my discussion with Sonya Campion, an active philanthropist who is into non-profit work. Not only did she and I speak for over an hour, but she also connected me to at least 10 other individuals in the non-profit sector in Seattle – all of whom I will meet for informational interviews after graduation. What I have learned throughout the never-ending networking/contact building process is that you have to sell yourself – you have to speak to your strengths, be professional, and always follow up with every contact. Also, it is a good idea to log all of the contacts you make, as you never know when they will again come in handy. What is important for all students to know is that networking isn’t scary at all and, in fact, I find it quite enjoyable. I love hearing how people got to where they are in their careers, I love it when I meet someone who knows someone else that I know, and I love sharing my own story and passions with others. And, the best part is that you can network anywhere! You can strike up a conversation with someone sitting next to you on a plane, someone who is standing in line behind you at an amusement park, or with the barista at your local coffee shop. Finally, I want to make a plug for Whitman’s Career Center. I think that Susan Buchannan and Noah Leavitt have done an excellent job this semester. They have listened to senior surveys, and they have brought alumni from a variety of fields to campus. Per their suggestion, I ordered personal business cards through the college. These along with an up-to-date resume and professional attire are key when it comes to making a great first impression. Networking is a chance to sell your strengths so it is important not to be overly modest. You never know what will come out of a conversation! About the Author: Alyssa Breetwor is a senior sociology major from Los Altos, California. Over the course of her time at Whitman, she volunteered as a college tutor at Walla Walla High School, helped start a community garden, inaugurated a weightlifting program for the teens at Pathways alternative school, and worked as a personal trainer. 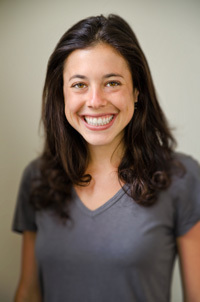 She is currently the chair of Whitman’s Senior Class Committee. She graduates from Whitman on May 20, 2012.